Suite Life: Biophilic design and the hospitality sector are a natural fit. Outline the ecosystem services that biophilic elements can provide. Describe some of the impacts that biophilic elements can have on the health and well-being of building occupants. 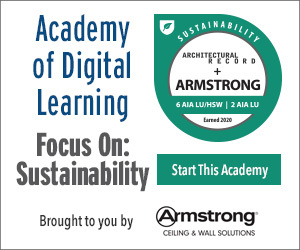 Identify the approaches to biophilia that are most appropriate to the hospitality sector. Describe how biophilia was incorporated into the Park Royal on Pickering and the Oasia, both in Singapore, and the 1 Hotel Brooklyn Bridge, in New York. 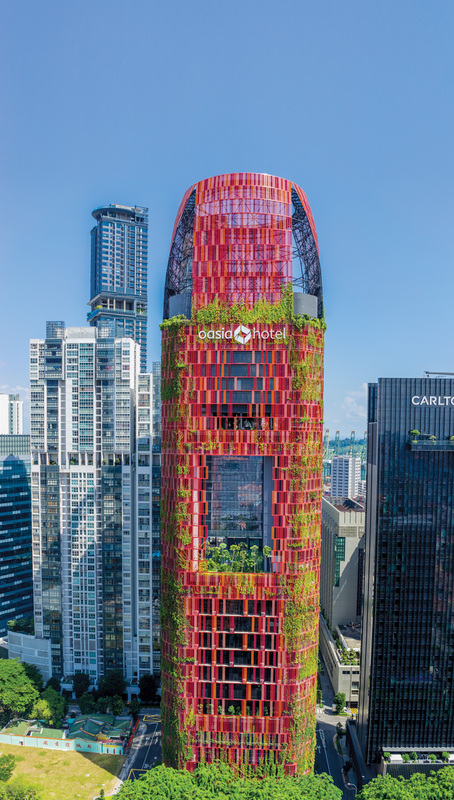 In downtown Singapore, where high-rises are built to their lot lines, Oasia, a new 27-­story hotel and office building, introduces some leafy green respite from the dense urban setting. Creeping plants of 21 different species climb across the tower’s red mesh facades, hummingbirds and insects feed on nectar, and the petals of spent flowers spin down into the streets below. 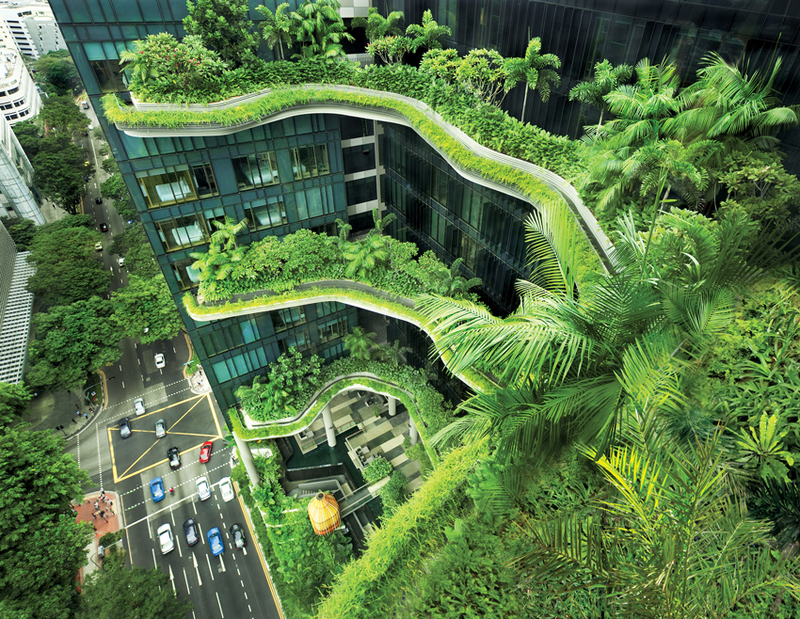 Creeping plants cover WOHA’s Oasia, a 27-story hotel and office building in Singapore. The greenery climbs the building’s outer envelope of expanded aluminum mesh, powder-coated in shades of red, orange, and pink. The lush expression of Oasia, which opened last April, is not difficult to achieve, especially in tropical Singapore. There have been plants on buildings for centuries, and there’s nothing really innovative about the technology used at Oasia. The hotel’s envelope consists of an outer layer of expanded aluminum mesh, powder-coated in five shades of red, orange, and pink. Behind the mesh, painted precast-concrete panels serve as the weather barrier. Between these two layers, the creepers that climb Oasia’s facades grow in giant fiberglass tubs, with a passageway for maintenance access. There’s some additional expense, but according to WOHA, the cost isn’t prohibitive, and may even be offset by savings elsewhere, on aluminum mesh and painted concrete cladding, for example, the combined cost of which is less than curtain wall. The biophilic design that characterizes Oasia (and WOHA’s work in general) stems from three complementary rationales. The first is stewardship of nature as cities expand: the need to create places for nature at the same time we create floor area. With increasing urbanization, to have any kind of connection to nature, we need to wrap it into our buildings. The second rationale is “just that selfish delight that comes from living a more beautiful, peaceful, centered, and calm life when you’re surrounded by nature,” says Hassell. A wealth of research from many disciplines demonstrates that this effect is genuine. Since a landmark study in 1984 documented improved recovery rates and reduced requests for pain medication in hospital rooms with a view of nature, hundreds of additional studies have demonstrated the positive impacts of biophilic environments, including reduced stress, improved cognitive performance, and enhanced creativity. The third rationale is ecosystem services—the multitude of ways natural systems support humankind. Biophilic features can often help with stormwater management, heat island reduction, and pollution mitigation, for example. Specific to the the hospitality sector, a 2014 study from the Cornell School of Hotel Administration (SHA) found that eco-certified hotels recorded higher resource efficiency for both operations and customer activities. Another 2014 study from the Cornell SHA found that LEED-certified hotels achieved superior financial performance, with higher daily rates, compared to their noncertified competitors, for at least the first two years after certification. Although LEED doesn’t explicitly require the inclusion of biophilic elements, a finding that customers will pay higher rates for a green hotel suggests economic benefits from an approach that integrates nature. Building on the Cornell financial-performance report, a forthcoming study from Terrapin Bright Green, a New York–based green building research and consulting practice, suggests that biophilia plays a role in customer preferences. Comparing guest comments across a sample of biophilic and conventional hotels, Terrapin’s researchers found the most frequent point of praise from guests who had stayed at a biophilic hotel was its design (whereas praise from guests who had stayed at one of the conventional hotels pertained most frequently to maintenance and service). This matters: according to a recent report from Deloitte, a global financial consultancy, in “the race for guest loyalty,” basics like cleanliness and comfort are no longer enough for hotels to differentiate themselves from their competitors. Millennials, in particular, who will make up three-quarters of frequent business travelers by 2025, are looking for a more memorable experience. Curvilinear gardens are integrated into the facade of WOHA’s Park Royal on Pickering hotel in Singapore. 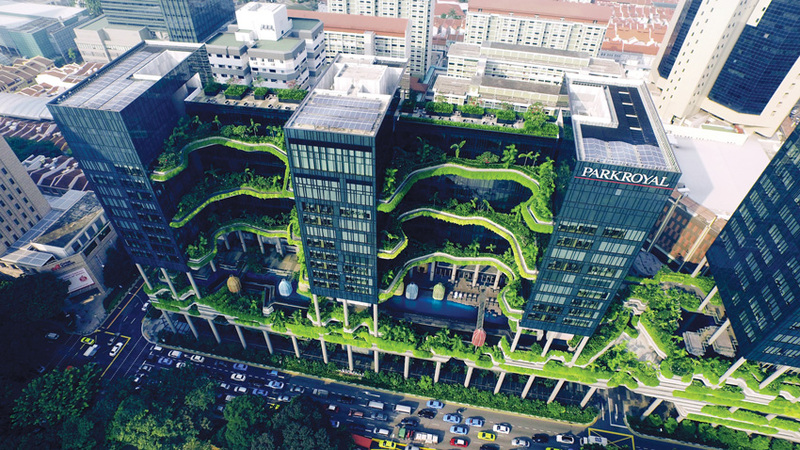 The Park Royal on Pickering, another WOHA-designed building, which has achieved Singapore’s highest environmental certification, provides an example of what the bio­philic effect can mean from a marketing perspective. The 300,000-square-feet hotel and office building includes 160,000 square feet of sky gardens, so that an adjacent park appears to be stepping up and through the building. Since the Park Royal on Pickering’s 2013 opening, it has enjoyed close to 100 percent occupancy, room rates double the original projections, and free publicity with its image appearing on travel-related Web pages as an icon of Asia’s hospitality sector. Park Royal has even seen bookings spill over to its other Singapore hotels through their association with it. 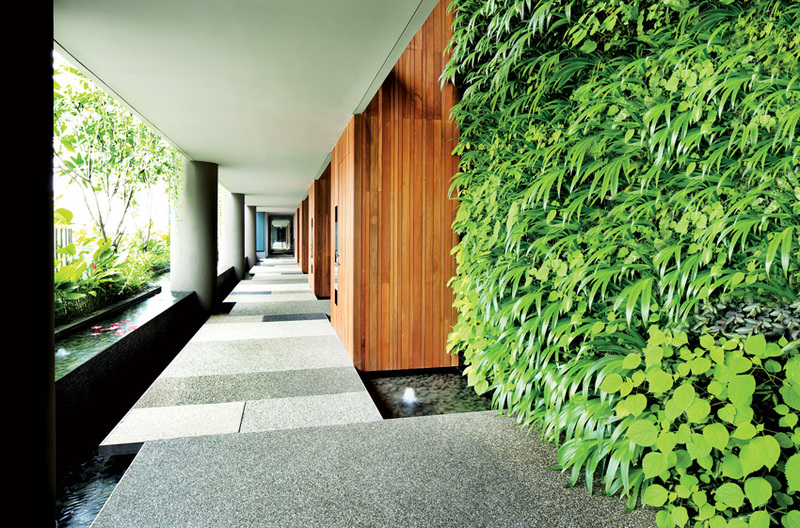 Exuberant greenery, although a dramatic expression, is not the only way to achieve biophilic effects. In a previous study, Terrapin identified three categories of biophilic design—nature in the space (the direct, physical presence of nature), natural analogs (nonliving evocations of nature such as organic sequences or shapes in artwork, ornamentation, or furniture), and nature of the space (spatial configurations that resemble conditions found in nature, including those that seem to provide refuge). Together, they comprise 14 types or patterns. To identify the strongest correlations to lowering stress, improving cognitive performance, and elevating emotion and mood, Terrapin cross-­checked more than 500 reports and academic publications pertaining to biophilic response, and then ranked the patterns by the strength of research supporting their effects on health and well-being. 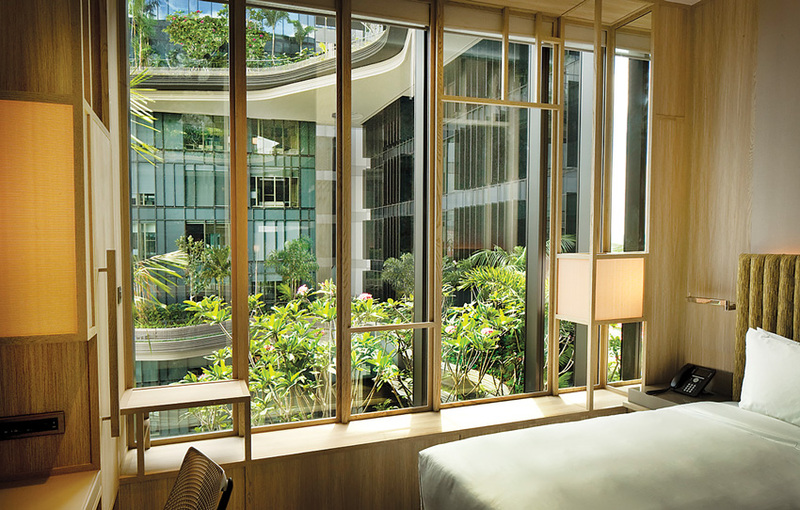 Guests can enjoy the lush greenery while walking through the outdoor corridors and from their rooms.